Loccitane Shea Butter Ultra Rich Cream Review: Ingredients, Side Effects, Customer Reviews And More. Loccitane Shea Butter Ultra Rich Cream refers to a skincare moisturizer product that is meant to hydrate your skin to ensure that you achieve a soft and supple looking skin. It is intended to nourish your skin to keep it healthy and improve its appearance. This product is well known to protect your damaged and dry skin. It is used to moisturize your skin especially if your skin is dehydrated or dry and thus, requires intensive hydration. It works perfectly without having to leave oily film on your skin. It is available online and it is priced at $34.00 only. You are required to read carefully the customer reviews available online for this formula. This is an important step as the reviews help you find out if the formula works well as claimed or not. About Loccitane Shea Butter Ultra Rich Cream- Does it Really Work? This skincare product is known to be paraben free and works well as expected for positive results. 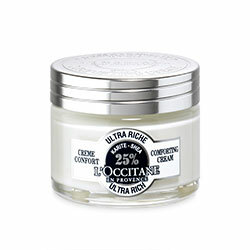 Loccitane Shea Butter Ultra Rich Cream has been formulated to nourish the skin for an improved look. It is meant to increase hydration of the skin for twenty four hours for you to keep a supple and soft skin throughout the day. It is a potent moisturizer for dehydrated and dry skin. It is known to be creamy and dense. It is rapidly absorbed into your skin without having to leave oily film. Proven to enhance hydration of the skin for twenty four hours. It protects the skin from being damaged by harsh environmental factors. What are the Ingredients in Loccitane Shea Butter Ultra Rich Cream? Water- it is used as a solvent. Glycerin- it is used as a humectant as it attracts moisture onto the skin. Castenea sativa seed extract- it is responsible in providing protecting properties to your skin for you to keep a healthy ski. Dimethicone- it is meant to prevent water loss from your skin through forming hydrating barrier on your skin. Cetearyl alcohol- it is used as a thickening agent. Shea butter- it is responsible in moisturizing your skin. Boosts skin’s elasticity and protects the skin from damage by free radicals. Clean and dry your skin before applying Loccitane Shea Butter Ultra Rich Cream on your neck and face. It is advised to use it twice in day preferably in the morning and evening. It hydrates the skin to keep it supple all day long. It helps in protecting your skin to ensure that you keep a healthy skin. It helps in replenishing your skin. It defends the skin from being damaged by environmental factors. There is less information on the ingredients contained in this formula. Does Loccitane Shea Butter Ultra Rich Cream have any Side-Effects? Loccitane Shea Butter Ultra Rich Cream side effects are not cited in the website by the manufacturer. Loccitane Shea Butter Ultra Rich Cream refers to a skincare formula that is meant to moisturize your skin to keep it supple throughout the day. It has been formulated to combat dehydrated or dry skin for you to keep an improved skin. It is absorbed rapidly into your skin and restores the balance of the skin.